This cheesy, creamy, chicken divan dish is incredible. I dare you to limit yourself to one serving! 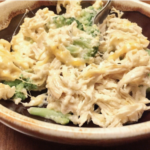 Made with fresh broccoli, cheddar cheese, heavy cream and chicken breasts, it filling and satisfying. While that's cooking, blend up your cauliflower using a food processor or a good blender like a Ninja (or better). Do it for a couple seconds just until it looks like rice. Check on your boiling chicken. Take it out and set it aside if it's reached 180 degrees. Add the cream and lemon juice and let simmer uncovered on low for about 10 minutes while it reduces. Mix it a few times throughout so it doesn't burn to the bottom. Add mayo, mix, and turn off burner. Use the other half to line the bottom of an 8x8 casserole dish.